Abstract. Atmospheric new particle formation (NPF) is an important phenomenon in terms of global particle number concentrations. 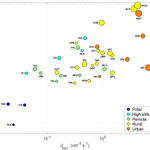 Here we investigated the frequency of NPF, formation rates of 10nm particles, and growth rates in the size range of 10–25nm using at least 1 year of aerosol number size-distribution observations at 36 different locations around the world. The majority of these measurement sites are in the Northern Hemisphere. We found that the NPF frequency has a strong seasonal variability. At the measurement sites analyzed in this study, NPF occurs most frequently in March–May (on about 30% of the days) and least frequently in December–February (about 10% of the days). The median formation rate of 10nm particles varies by about 3 orders of magnitude (0.01–10cm−3s−1) and the growth rate by about an order of magnitude (1–10nmh−1). 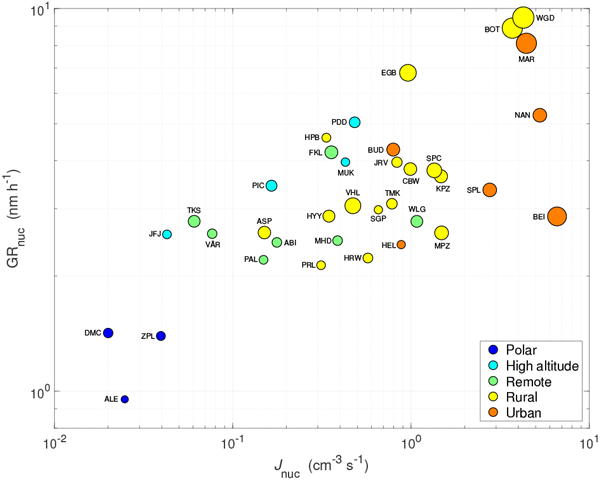 The smallest values of both formation and growth rates were observed at polar sites and the largest ones in urban environments or anthropogenically influenced rural sites. The correlation between the NPF event frequency and the particle formation and growth rate was at best moderate among the different measurement sites, as well as among the sites belonging to a certain environmental regime. For a better understanding of atmospheric NPF and its regional importance, we would need more observational data from different urban areas in practically all parts of the world, from additional remote and rural locations in North America, Asia, and most of the Southern Hemisphere (especially Australia), from polar areas, and from at least a few locations over the oceans. How to cite: Nieminen, T., Kerminen, V.-M., Petäjä, T., Aalto, P. P., Arshinov, M., Asmi, E., Baltensperger, U., Beddows, D. C. S., Beukes, J. P., Collins, D., Ding, A., Harrison, R. M., Henzing, B., Hooda, R., Hu, M., Hõrrak, U., Kivekäs, N., Komsaare, K., Krejci, R., Kristensson, A., Laakso, L., Laaksonen, A., Leaitch, W. R., Lihavainen, H., Mihalopoulos, N., Németh, Z., Nie, W., O'Dowd, C., Salma, I., Sellegri, K., Svenningsson, B., Swietlicki, E., Tunved, P., Ulevicius, V., Vakkari, V., Vana, M., Wiedensohler, A., Wu, Z., Virtanen, A., and Kulmala, M.: Global analysis of continental boundary layer new particle formation based on long-term measurements, Atmos. Chem. Phys., 18, 14737-14756, https://doi.org/10.5194/acp-18-14737-2018, 2018.